Grace's Guide is the leading source of historical information on industry and manufacturing in Britain. 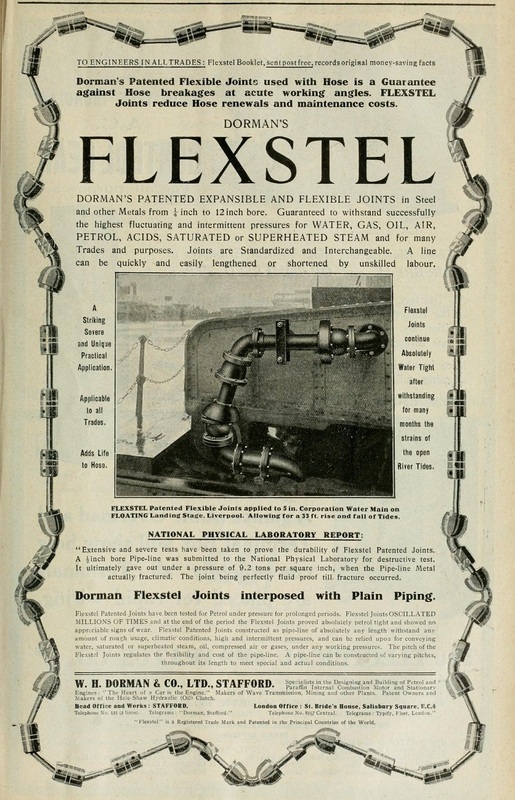 This web publication contains 132,938 pages of information and 210,195 images on early companies, their products and the people who designed and built them. 1922. Wave Generating Plant for Bombay. 1931. 12-26 B.H.P. 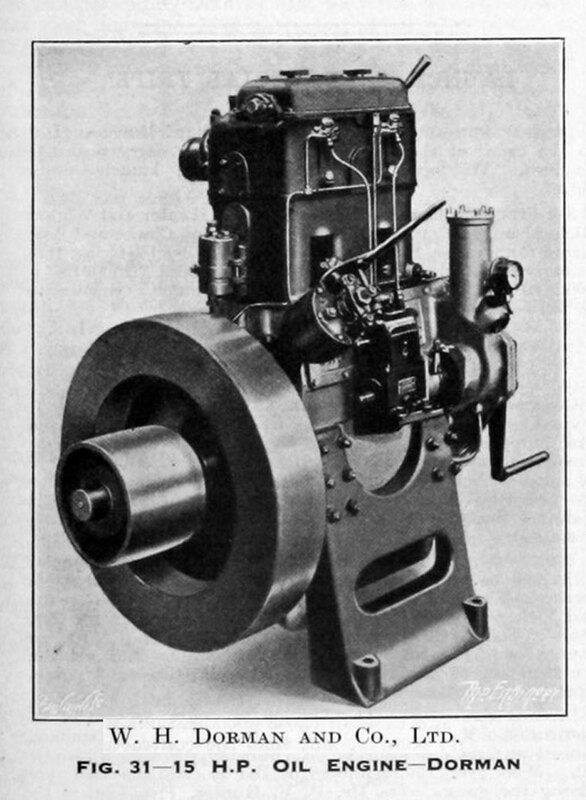 Two Cylinder C.I. 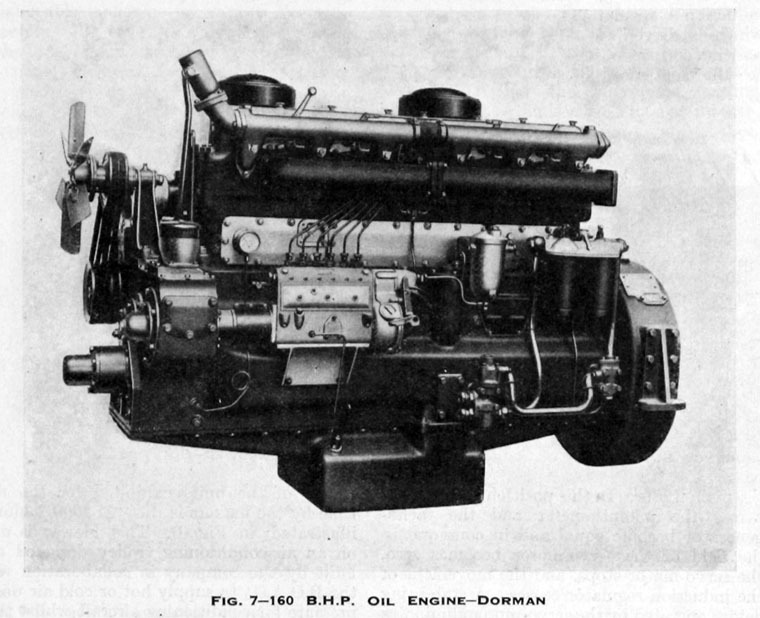 Oil Engine. 1933. 15 H.P. 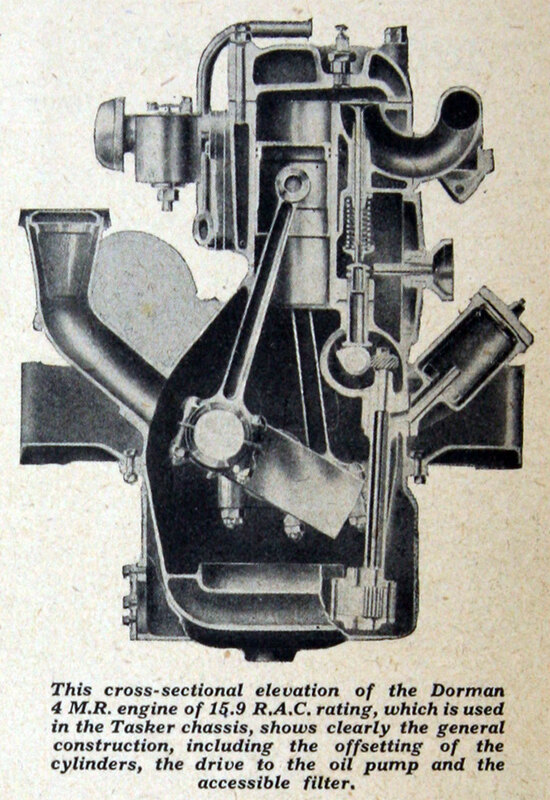 Oil Engine. 1951. 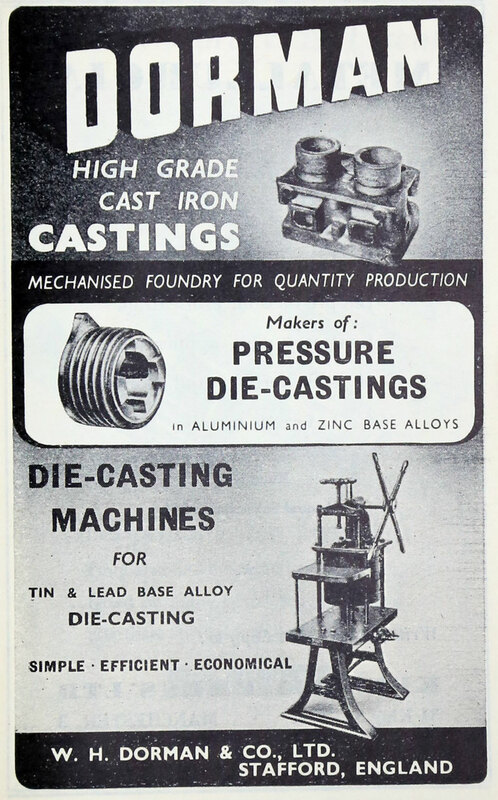 Advert for high-grade cast iron castings, pressure die-castings and die-casting machines. 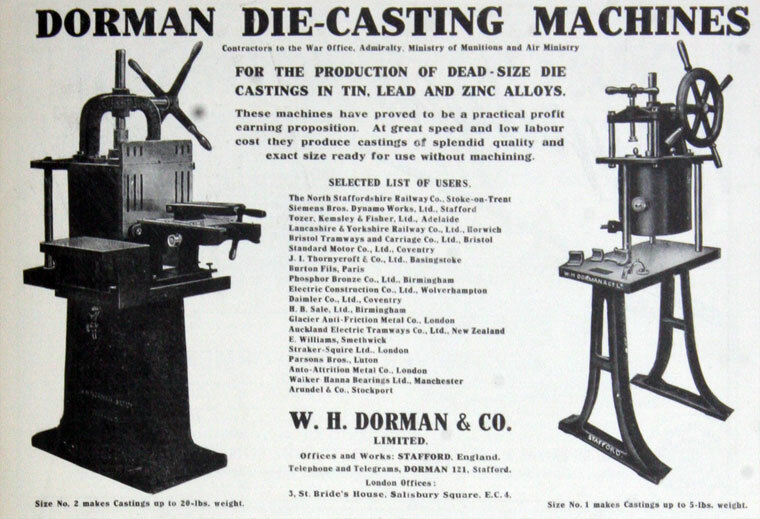 1870 William Henry Dorman started in business. For some years the firm specialised in the production of boot and shoe-making machinery and parts, first for the English and American Shoe Machinery Co.
1910 A special printing press was being made by the firm. 1911 William Henry Dorman retired from the business. 1913 "Engineers to the (Motor) Trade; contractors to the Admiralty and War Office". 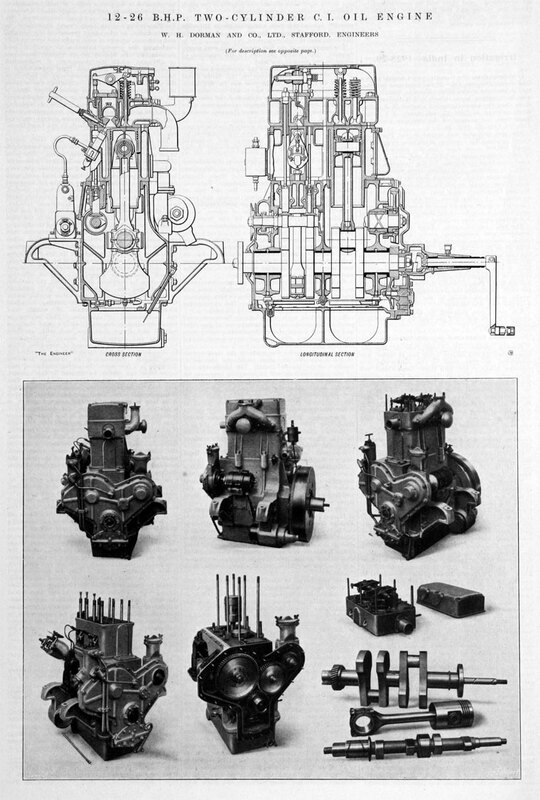 1914 Claimed to be "internal combustion engine specialists"
WWI Built many thousands of "C.C." interrupter gear for aircraft under licence from Walter Haddon and George Constantinesco. 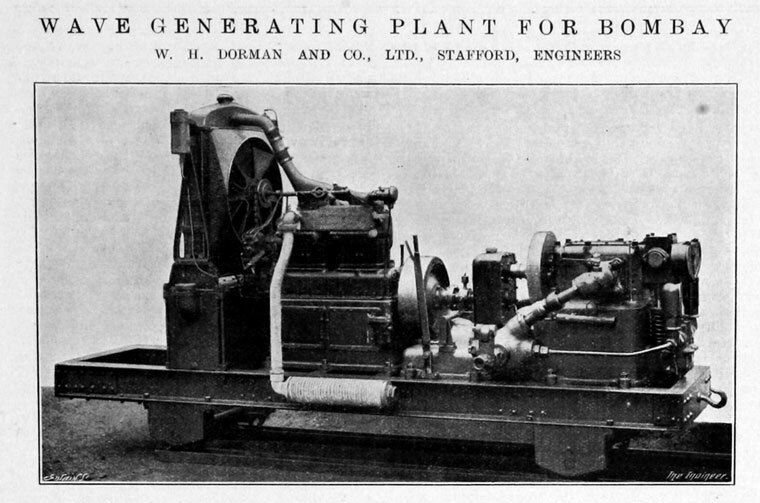 Built many engines for the government. 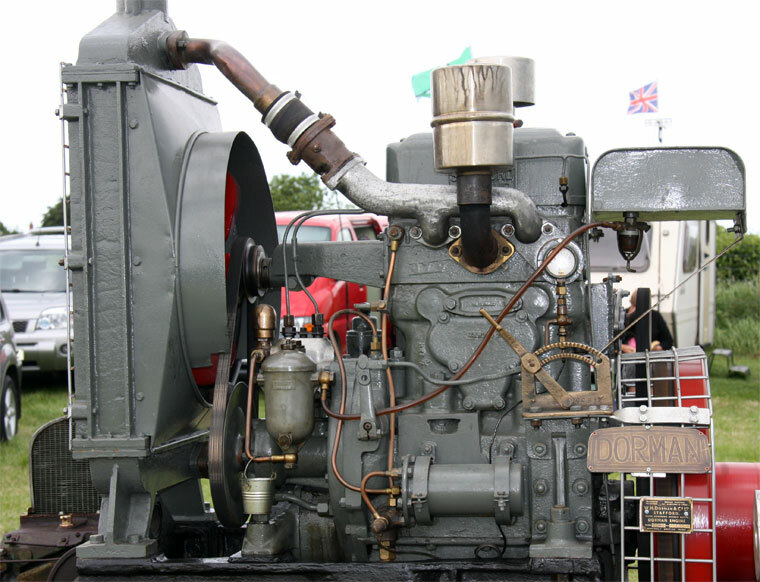 1920 At the Darlington Royal Agricultural Show they exhibited petrol driven lighting sets ranging from 5 - 20 kW. 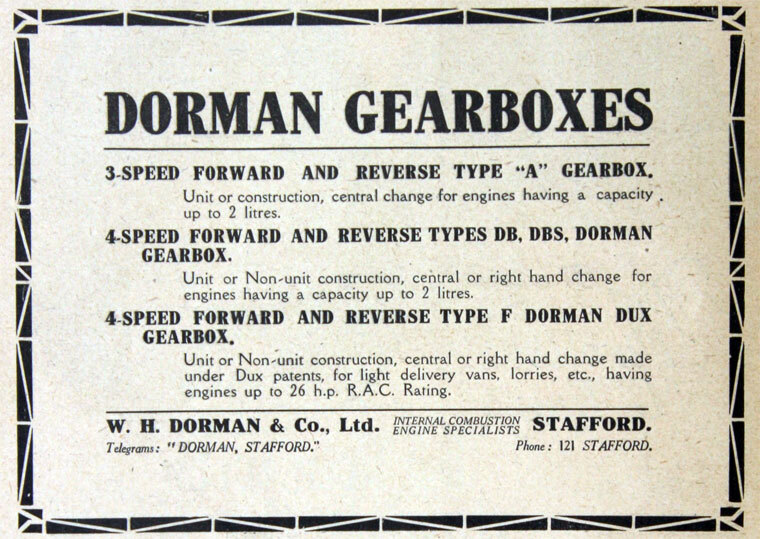 1921 Mr John E. Dorman retires from director of the company to join the board of Henry Meadows, which made gearboxes often used with the company's engines. 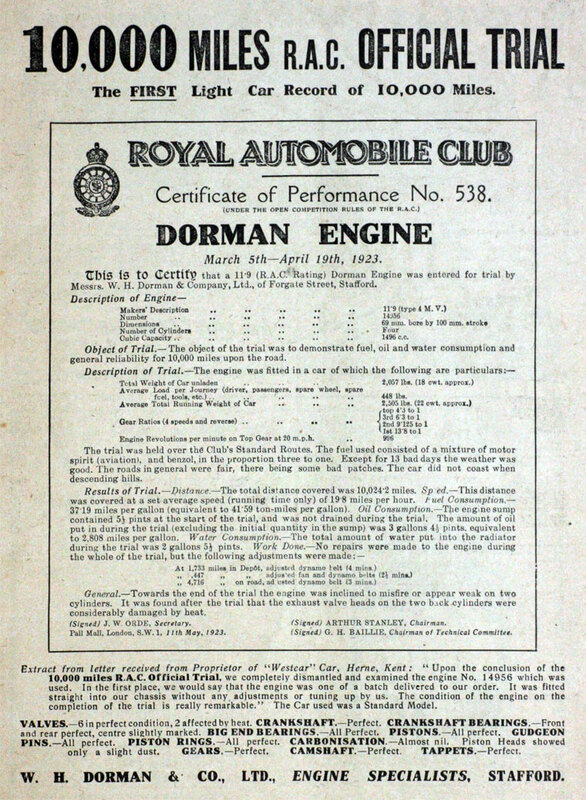 1926 29th January - Founder, Mr William Henry Dorman died at the age of 93. 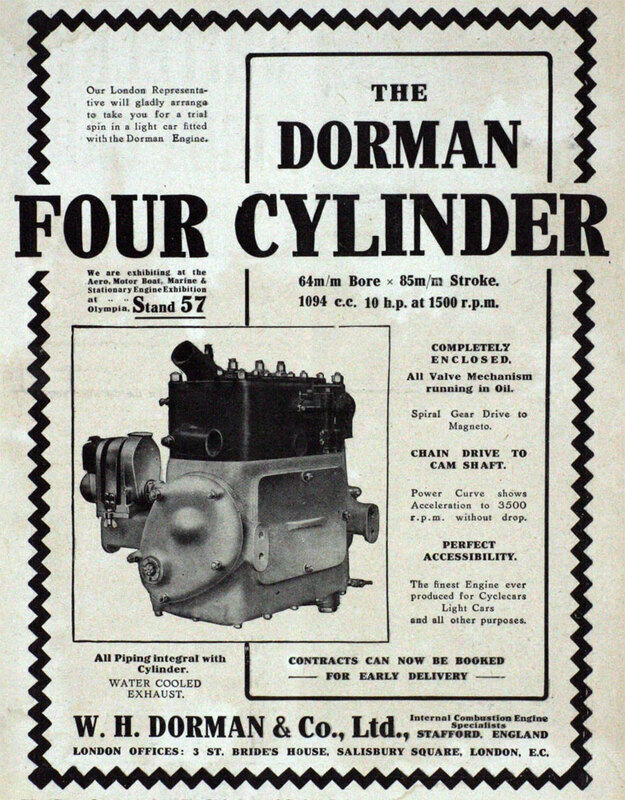 1932 Introduced the Ricardo-Dorman Diesel engine in a six-cylinder and four types of four-cylinder versions. 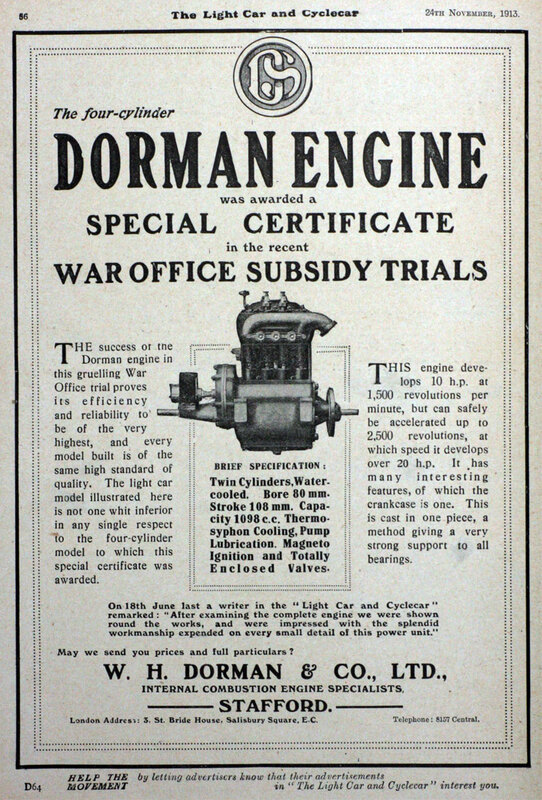 1944 Producing the DW and DL engines for marine use. 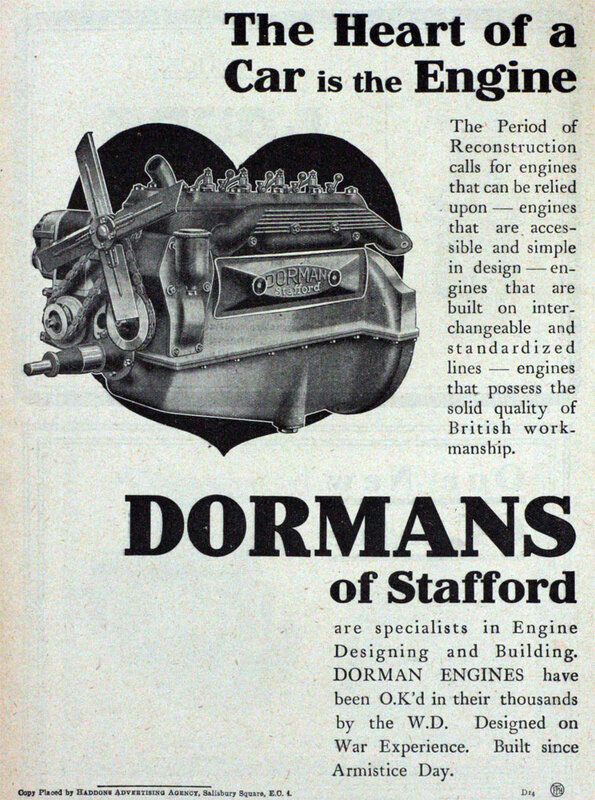 1959 W. H. Dorman and Co purchased W. G. Bagnall, a neighbouring Stafford railway engine maker, from Heenan and Froude in exchange for Dorman 'A' shares. 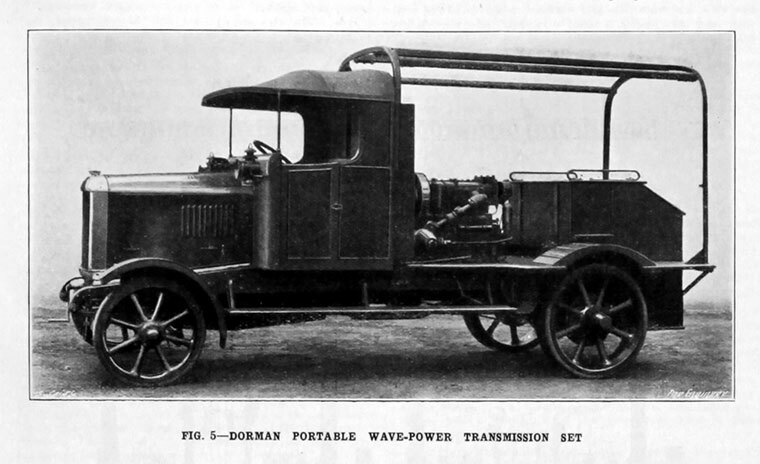 1961 English Electric Co acquired W. H. Dorman and Co.
1919 Ruston and Hornsby attempted to diversify and one outcome was the Ruston-Hornsby car. 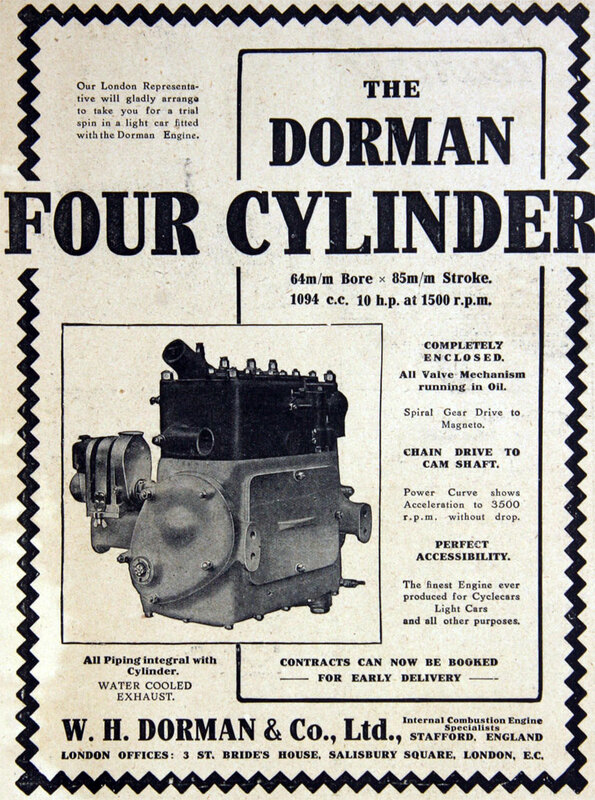 Two versions were made, a 15.9 hp with a Dorman 2,614 cc engine and a larger 20hp model with 3,308 cc engine of their own manufacture. The cars were expensive and never reached the hoped for production volumes. About 1,500 were made between 1919 and 1924. This page was last edited on 17 November 2016, at 16:56.